The Core Monitored Assets permissions define access to the monitored assets, groups, and Query Analyzer data. The Monitoring Services permissions are dependent on these permissions. Each of the Monitored Asset permissions is dependent on the others. For a new role, all permissions default to None. Setting Server Group to Read-Only automatically sets all other Monitored Asset permissions to Read-Only. Similarly, if you set Server Group to Administer, MySQL Instances is also set to Administer. 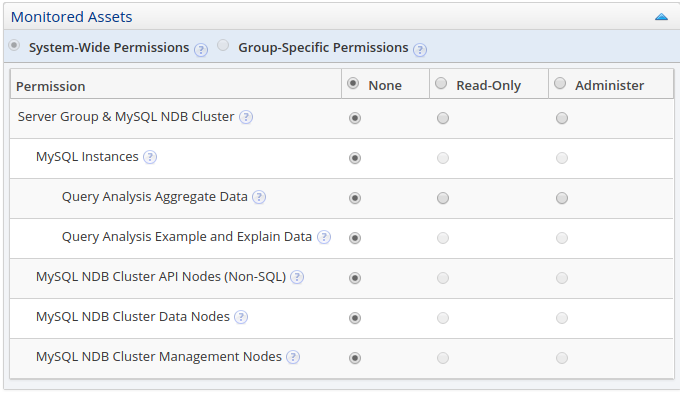 It is not possible to set MySQL Instances or any of the NDB Cluster permissions to None if Server Group is set to Read-Only or higher.